After two years of positive performance across the board, with almost no asset class in negative territory, 2018 is marking a change of direction, with an unprecedented percentage of asset classes in red. 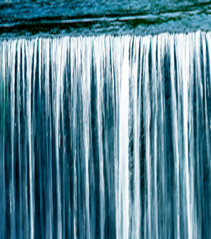 This may cause a sense of uncertainty among investors facing uncharted waters ahead. The challenge has been even bigger for European investors still living in a zero-rate era, facing an environment of no returns on the bond side and losses across all risk assets, exacerbated by idyosincratic stories such as the Italian budget confrontation and by the still uncertain Brexit scenario. To navigate this market phase, we must recognise that investor sentiment, more than fundamentals and instrinsic value, is driving markets today. In fact, on one side the economy remains resilient, but after a very long expansion, the feeling that the music is changing and we may be heading towards a recession in the next couple of years, is gaining ground. The economic slowdown is occuring at diverging rates and at a time of profound transformation in global trade dynamics. This, compounded with the geopolitical tensions and the fact that the earnings peak is behind us, is increasing the risk that an already very long cycle may be nearing its end. We don’t buy the view that the cycle is over yet, though risks are certainly tilted on the downside. In our view, instead, in an era of the dominance of politics, where sentiment can move fast, some of the recent market moves have the features of an overshoot on the downside that can offer opportunities for long-term risk-taking, bearing in mind that short term volatiiliy will persist. This caveat is key, especially at this stage of the cycle and with still high political uncertainty. The big question is, therefore, if it is time or not to increase risk allocation and how. We call for starting the year with a defensive stance on the core allocation, with a focus on quality, value and liquidity and adding risks throughout the year in oversold assets that may offer compelling long-term risk-adjusted returns, while keeping a strong focus on sustainability of debt and earnings growth. In this respect, the areas where we see most opportunities to be played in 2019 are Emerging Markets (both bonds and equities) as we approach a possible pause in the Fed hiking cycle that could benefi t these investments and European equities, once some political risks will diminish after EU elections. Patient and selective investors, able to look beyond short term noise and accept the higher volatility of a late cycle featuring rising political risks, will be able to navigate these uncertain waters. Asset managers, on their side, should answer these challenging times by launching innovative solutions to help enhance risk-adjusted returns, manage behavioural risks and increase the likelyhood that investors will reach their goals. Alignment of goals, investment horizons and risk tolerance (keeping in mind that today’s environment may require some additional risk taking) will be the compass to navigate with success this new market phase. 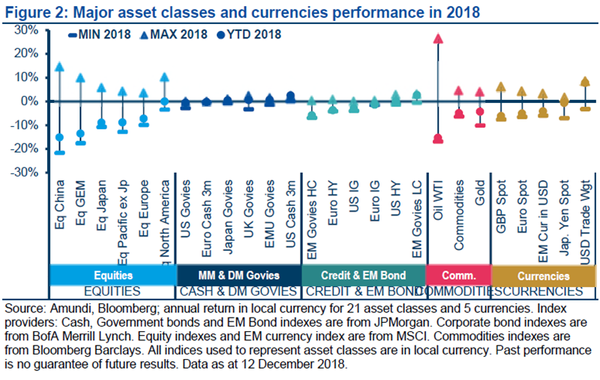 Diversification has been challenged in 2018, as almost all ingredients (asset classes) were poor (negative performing). 2018 has proved to be very challenging for portfolio construction, as well as showing a changing regime of returns. To put this into perspective, in the years 2002 to 2017, our analysis shows that, on average, around 82% of major asset classes (including 21 different indexes of regional government bonds, equity and commoditymarkets) recorded positive performances. 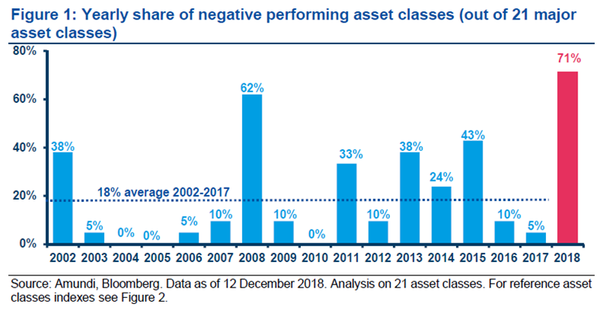 In 2018, the story has changed: we have experienced an unprecedented year in which around 70% of asset classes globally have been in negative territory and the few positive areas recorded performance in the range 3%. Tariffs’ imposition was a big game changer in the year, contributing to the divergence between US assets (favoured) and the rest of the world. The imposition of tariffs by the US administration was the big game changer in what we see as the return of a greater role of politics (driven by inward looking forces) in financial markets. This contributed to the divergent dynamics between US assets (top performer, even though with very low positive returns) and EM (with EM equity worst performing). Bond investing had also been challenged by the rising rate environment. 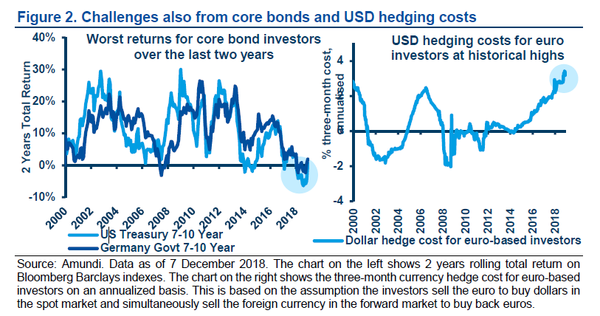 In addition, non-US-dollar investors faced the challenge of high hedging costs, making it difficult for them to exploit even modest opportunities in US assets. The fixed income component also disappointed investors. 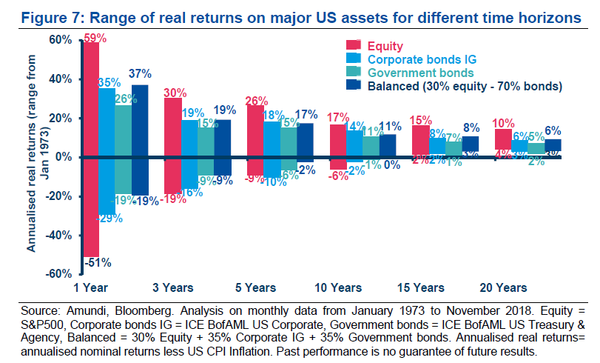 In fact, against a backdrop of rising rates within an overall low rate environment, returns on core government bonds did not generally perform as a traditional diversification engine and for government bond investors, the last two years have been the worst performing over the last two decades. Volatility is back and is set to remain higher than in the past post crisis era. Areas most vulnerable or where valuations are more stretched is where risk-off sentiment is materialising. This world of unsatisfactory returns came with episodes of volatility, based on multiple sources of uncertainty. The tightening cycle of the Federal Reserve, coupled with stretched valuations in financial markets, was the basis of the February risk-off episode. A sequence of ongoing price dislocations also emerged throughout the year: starting with idiosyncratic stories in emerging markets (Argentina, Turkey), the risk-off sentiment has been further exacerbated in Europe by the Italian budget situation. More recently, markets have started to price in a synchronised slowdown in global growth, hence the belief that we have likely reached the peak in earnings acceleration and should prepare for a slowdown in 2019 and 2020. As a result, the most recent autumn moves, have broadened their effects to the most stretched areas (in terms of valuations in the US market), marking a further rise in volatility that in our view will persist next year. The dominance of politics, a key feature of this market phase, is also contributing to the rising volatility and represents a potential trigger of risk-off episodes, especially in a phase of the cycle when markets are more vulnerable to changing market sentiment. Yet, when sentiment shifts, is also when price dislocations can open-up opportunities for long term investors. We expect a low return regime to persist, but less stretched valuations may offer more opportunities in 2019 compared to 2018. 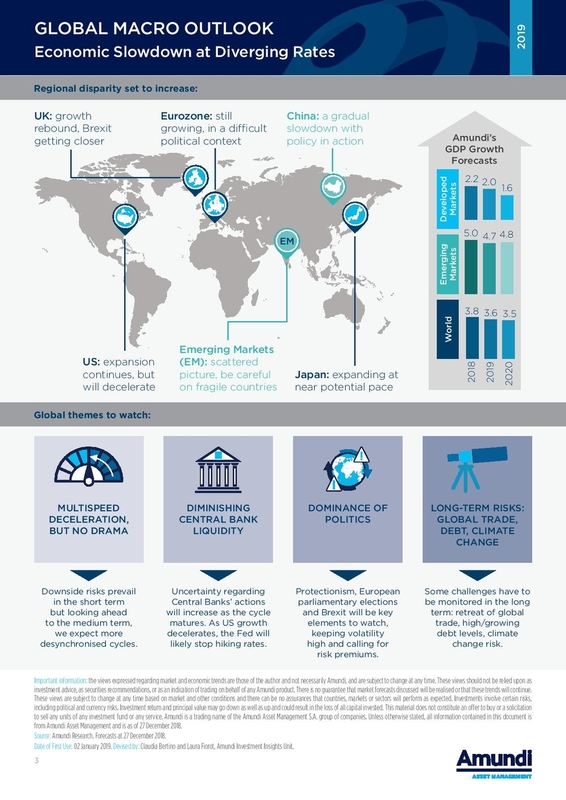 We expect the key features for 2019 to be: decelerating global growth, the continuation of trade disputes, weakening earnings outlooks from the current peak and higher volatility. However, in our view, moving forward, investors may find more opportunities compared to 2018, as some areas have already repriced and hence we enter the New Year with less stretched valuations across the board. The market focus will be on growth expectations and monetary policy in order to assess how long the economic cycle may last. The first half of the year will still be highly uncertain as geopolitical events (Brexit and European elections in May) will weigh on investor sentiment. The market focus will be on growth expectations and monetary policy. Key to assessing expectations on both fronts, is the evolution of political actions, in particular on the tariffs front and their implications on business and investor sentiment. Should the US economy start to slightly decelerate, as we believe, with inflation still under control, overall this could be good news for the market, as the Fed could pause the hiking cycle with the aim to further prolong the economic cycle. The Fed is walking on a tightrope to engineer a soft landing that, if achieved, could benefit financial markets. The Fed is walking on a tightrope. After a great 2018 supercharged by the fiscal stimulus, GDP growth is set to decelerate and the engineering of a soft landing is going to be key to avoid a dangerous overtightening of financial conditions that could damage not only the US economy but also the global cycle. Less tightening of financial conditions could, on the contrary, help to further prolong the US economic cycle that despite being the second longest is not so strong by historical standards and would also be supportive for some selective risk-taking throughout the year. However, as the overall debt in the system remains high, investors should be careful in assessing market opportunities and put debt sustainability at the forefront of the selection criteria. Against this backdrop, investors should seek to build resilient portfolios around 4 key themes. In our view, investors should play defensive, enhance diversification and tactically play market opportunities that offer compelling risk/return profiles. A still constructive earnings outlook should support equity markets’ appeal, based on a rotation of themes. Selection, with a focus on quality, valuation and ESG factors across the board will be key to navigate uncertain markets. With the Federal Reserve approaching a pause in the hiking cycle, most of the rate rises are behind us. Bonds are going to be back in focus, especially in the US where a more neutral duration stance is advisable at this point of the hiking cycle, but flexibility will remain key. In credit, lower liquidity provisions from central banks globally and still high levels of debt, will call for the selection of quality bonds. Moving forward, investors should seek entry points to benefit from recent price dislocations. One area is Europe, once the political risk diminishes. Emerging markets (EM bonds in USD in particular), but also EM equity could be another bright spot, as the threat from rising interest rates and a strong dollar are likely to dissipate. Here an unconstrained approach that can combine equity and bond opportunities across the EM landscape could offer a compelling way to re-enter the market, by playing opportunities across the capital structure. In fixed income markets, selective pockets of values could also materialise later in the year in the high yield segments, especially in Europe, where valuations are becoming more attractive and fundamentals are solid. With low expected returns ahead and high economic and political uncertainty, capital preservation will be key, as well as exploring new frontiers to increase return potential and mitigate possible downside.With this aim, unconstrained and absolute return approaches, with a strong risk management discipline, should deserve a greater role in the asset allocation. Tough times can lead to behavioural mistakes. It is key to keep a strong focus on each investment time horizon. 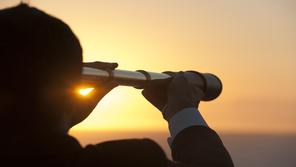 From an investor perspective, this market phase will require maintaining a strong focus on keeping the appropriate time horizon, despite short-term challenges. To ensure this alignment, it would be appropriate to segment the portfolios among different investment horizons, reflecting different needs/objectives. 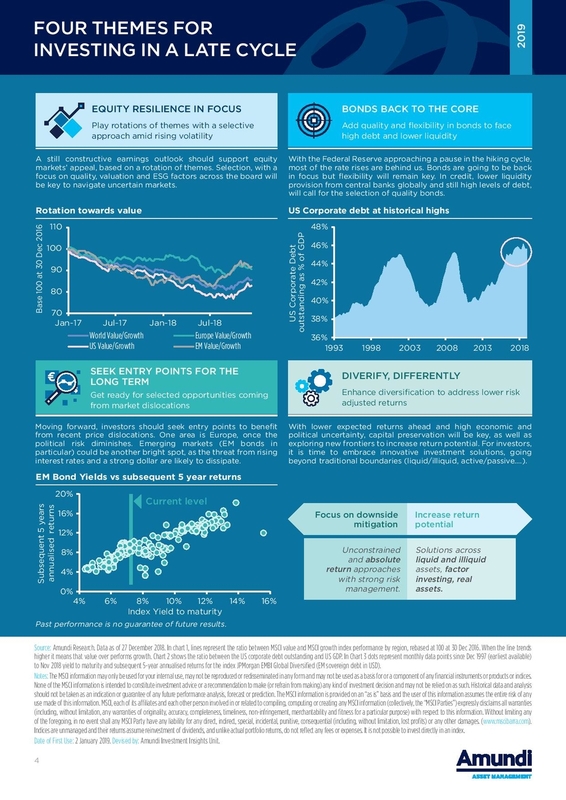 Investments designed for a short-term horizon should be focused more on downside risk mitigation, as also more conservative asset classes such as government bonds or conservative balanced portfolios (70% bonds/ 30% equity) can experience significant losses in the short-term, while they rarely did in the past, over a horizon of 5 years or more. With a long-term view, it is key to explore risk assets, equity in particular, as with a very long investment horizon this tends to be the best performing asset class. Looking ahead we foresee an era of lower expected returns, in which investors in search for value will have to focus on fundamentals. 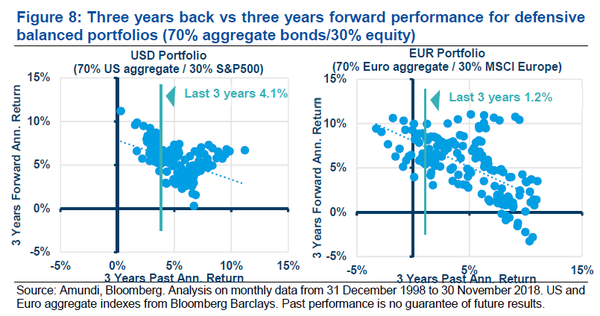 When looking at the medium to long term horizon, investors should acknowledge that future expected returns will probably be lower, compared to in the past, especially in Europe where bond yields remain very low and therefore bond return expectations in core government bonds remain subdued. With the end of the secular bull markets in bonds, investors will have to get back to fundamentals in search of long-term value and also be ready to take more risk to exploit higher yielding opportunities. Selection based on sustainability of debt and earnings: moving from a long decade of market directionality, with the tailwind of quantitative easing, towards an era of lower liquidity in the system and tightening in financial conditions, investors should become more selective and focus on debt, leverage and earnings sustainability at the security level. Mean reversion patterns, which characterized markets over the last 20 years, should favour some assets where valuations seems overly pessimistic. Keeping the appropriate horizon is also important for reducing the risk of behavioural mistakes i.e. exiting the market and not re-entering it in a timely manner when a rebound materialises, thereby causing a crystallisation of losses. In fact, as investments exhibit a mean reversion pattern, future performance will likely not mirror most recent ones. This has occurred for instance over the last 20 years (see figure 8) when 3 years of poor annualised returns in a defensive balanced portfolio (70% bonds, 30% equity) have been generally followed by 3 years of better returns. Hence, mean reversion patterns should favour some assets where current valuations seems overly pessimistic, such as in the equity space, while in core bonds we also start to see some sign of improvement in yields, though expectations on future returns remain low. With lower expected returns compared to the last 10 years, investment innovation is key to seek new ways to enhance long-term risk adjusted returns. 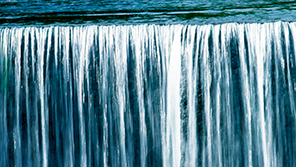 Continuum solutions across liquid and illiquid assets. 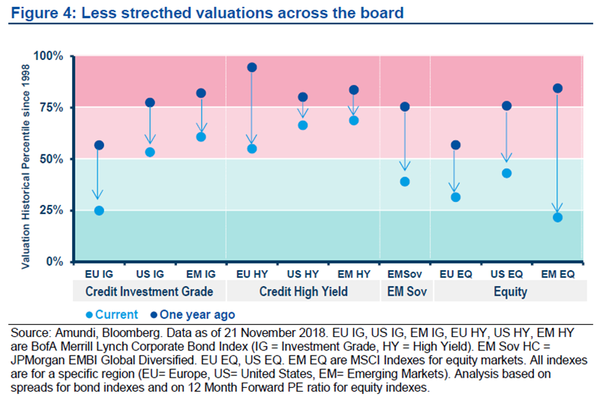 In an era of still low rates, especially in Europe, investors in search of higher yield, with a long-term horizon and able to bear some liquidity constraint, can benefit from embracing a flexible allocation approach, across the full spectrum of markets and segments, ranging from public to private markets and from liquid corporate bonds (both IG and HY) to less liquid assets (including secured assets, private debt, and structured finance related debt). Including factor investing across the board. In an era of low expected returns, we think investors should further embrace factor investing. While the benefits of equity factor investing have been already somewhat explored by investors, thanks also to the development of smart beta and factor investing solutions, we think it is time to extend factor investing also to other asset classes such as fixed income. Go further on ESG. ESG investing is going mainstream among institutional investors, in particular in Europe, where regulators are also starting to recommend to take into consideration long-term ESG risk factors. With the increase in ESG reporting from issuers and further adoption of ESG among investors we expect ESG factors to further reward investors moving ahead. Thematic investing around key material long-term themes for investors. Investors with a long-term horizon, can also exploit thematic investing around welldefined themes underpinned by social or economic transformation that can result in profound and material transformations at company and sector levels with a high degree of probability. Themes that are emerging as most likely to have impact in the future, are for instance, the ones related to climate change, driven by increasing regulation, pushed by policy makers, as well as awareness by investors. 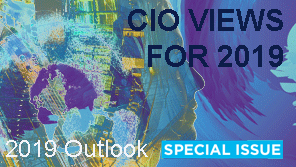 With late cycle features continuing to materialise and a higher level of vulnerability developing due to the uncertain geopolitical backdrop, 2019 will require investors to embrace a more prudent approach, despite the benign global economic outlook. In a market environment characterised by disruptive trends and possible regime shifts, asset managers need to evolve and to enhance their capabilities to understand, measure and factor these new trends into investment processes.